Days of Our Lives Spoilers: Claire Fights for Her Man--and It Gets Ugly! 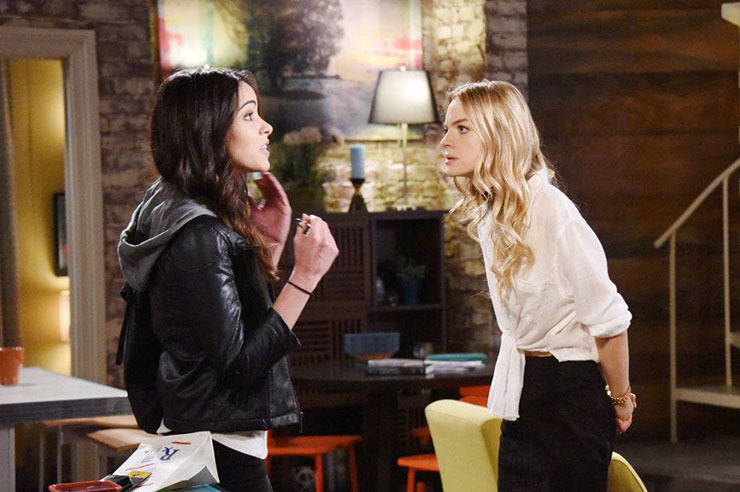 Claire is so not pleased with Ciara in the Days of Our Lives spoilers. The Days of Our Lives spoilers for Monday, March 20th, tease a very special guest appearance: Claire’s inner psycho! Claire (Olivia Rose Keegan) starts the week out by unleashing on Ciara (Vivian Jovanni). She is not pleased about Ciara’s now openly crushing on Theo (Kyler Pettis). As many fans feared, this knowledge is only going to make her dig her heels in further. And Monday she does something unscrupulous to make sure she is Theo’s one and only! Also, Ciara walks in on Claire and Theo about to do the vertical tango. With that interruption, the moment passes, which won’t please Claire. Chad (Billy Flynn), meanwhile, confesses something to Abby (Marci Miller) about Gabi (Camila Banus). Hmmm…that he still totally has the hots for her but still loves Abby too? After months alone on the farm, Eric (Greg Vaughan) finally decides to pack his things and go home to Salem. Hallelujah! We’ve missed him, and we know we’re not the only ones. Despite progress in that area, Eric is still unready to be too close to Jennifer (Melissa Reeves), it seems. He pushes her away– and after all the kissing last week! Dario (Jordi Vilasuso) and Gabi (Camila Banus) commiserate. And they have a lot in common these days to commiserate about. They both want people they can’t have, and those two people happen to be in a relationship. We’re, of course, talking about Chad and Abby. This foursome doesn’t look like it’s going to get any less complicated any time soon!